For the past two years my brother-in-law has been completing sudoku puzzles, something he finds challenging and entertaining, but something I know little about, until now that is. 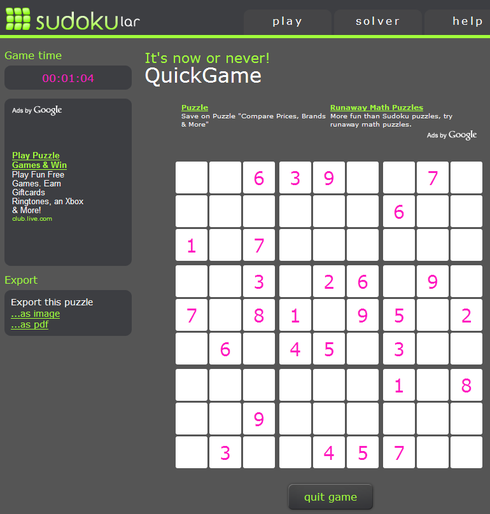 A German based start-up, Sudokular, offers online sudoku and leverages syndication to send daily sudoku puzzles. Sudoku is a game of logic that requires brains and concentration, and according to several anti-aging sites, wards off degenerative brain diseases like Alzheimer’s. I’m all for warding off any kind of disease, so I was raring to get started. Sudoku has only one rule, fill in the game board so numbers 1 through 9 occur in any order only once in each row, column or box of three by three squares. This seemed simple enough, I thought. Games are available at various difficulty levels, from easy, to standard and then hard. A game mode of either simple mode or expert mode can be selected and the game begins. Never having attempted a sudoku puzzle, I signed up for the easy and simple mode. I also activated the in-game help, which allowed my input to be checked while the game was running. After playing the game for 17 minutes, (a clock begins ticking as the first number is placed on the board) the board was filled, and a quick look revealed my score, based on the total number of correctly placed numerals. I did remarkably well for a beginner. Sudokular is successful at captivating one’s attention and can be played in place of the standard Solitare game so many use to pass time. I definitely have a new respect for all those sudoku players I’ve observed at Starbuck’s. Bravo!